Cheers to luxury and one more reason to treat yourself. The Cypress Room is welcoming more luxury to Miami’s Design District, South Florida’s growing neighborhood dedicated to innovative fashion, design, architecture and dining experiences. 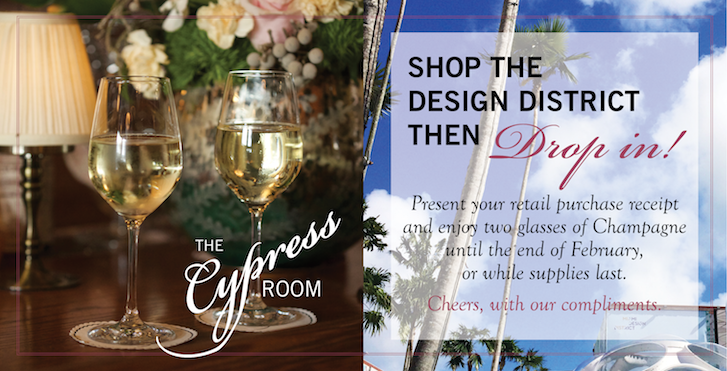 Guests shopping from 38 to 40th Street in between North Miami Avenue and Northeast 2nd Avenue may drop into The Cypress Room, present their retail receipt, and enjoy two complimentary glasses of Champagne at lunch or dinner from now until the end of February or while supplies last. Giorgio Armani, Hublot, Burberry, Bvlgari, Lanvin Boutique, and Valentino are just some of the stores to recently open. Listings are updated regularly here on designdistrict.net. In the background, DOME, 1979/80-2014, Buckminster Fuller. In the fore, Xavier Veilhan’s Le Corbusier, 2013. We are so proud of our visionary neighborhood in Miami, pushing the envelope to innovate and drive the cultural evolution of The Magic City. Works of art for public enjoyment is just one of the ways this is happening. In Palm Court, the ball drops in the magic triangle of our three restaurants with Michael’s Genuine Food & Drink across the street to the north, Harry’s Pizzeria two blocks to the west and The Cypress Room two blocks south southeast. Park in the new underground Palm Court garage and rise through DOME (1979/80-2014, Buckminster Fuller) to begin your shopping adventure as a figurine in your own personal sun globe. In 1965 the artist designed and patented the Fly’s Eye Dome, which he called an “autonomous dwelling machine.” Prototypes began to be built by hand in 1977 and by 1983; three of the fiberglass spheres in various sizes (12-foot, 24-foot, 50-foot) had been produced. Fuller died before he was able to realize his vision for the structure. However, almost 50 years later, the design, a Monohex variation of the geodesic dome, can clearly be seen as a forerunner of today’s green building movement. 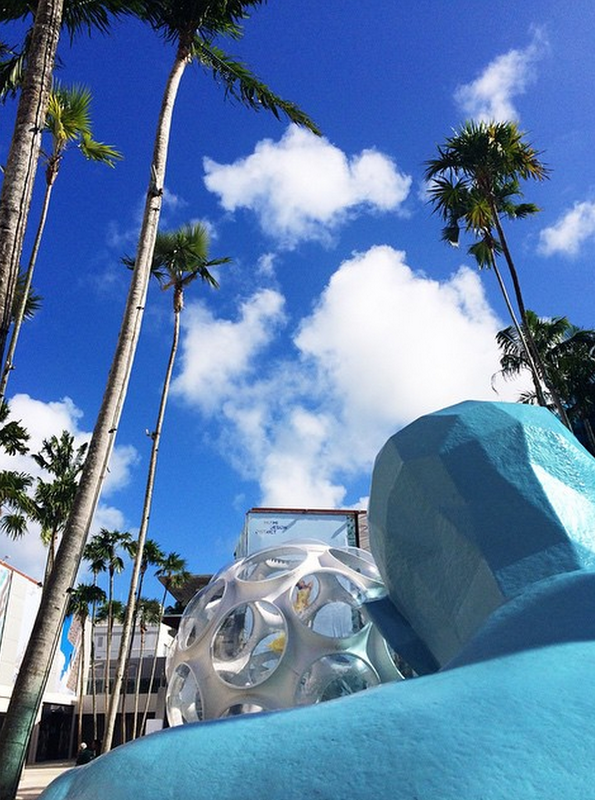 In 2011, collector and DACRA visionary Craig Robins acquired the 24-foot prototype with the intention of exhibiting it and using it as inspiration for a key element of the Miami Design District. The following year, The Buckminster Fuller Institute, in partnership with Goetz Composites, ConformLab and DRDesign, began the development of a program to complete Fuller’s vision, using advanced technologies and materials not available to Fuller in the 1970’s. BFI was then commissioned to produce a Fly’s Eye Dome utilizing state-of-the-art materials, intelligence and techniques, to be prominently incorporated in the Miami Design District 2.0 here. A throwback to the sophistication of 1920s fine dining, the restaurant offers an a la carte menu, as well as an accessible Lunch Prix Fixe of 3 courses for $33. Some guests may prefer to relax and stay a while, enjoying wine pairings to complete the experience at $51. For others, it’s comfortably out in under an hour and back to business or shopping. Dinner’s Tasting Menu includes 5 courses for $95, or with wine pairings for $195. 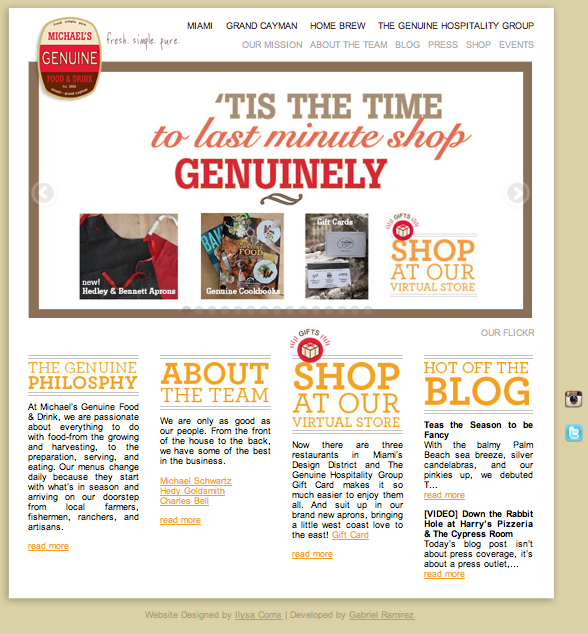 Menus change regularly and are updated in realtime on thecypressroom.com. The Cypress Room is open for lunch Monday through Friday from noon until 2:30 p.m. and dinner Monday through Thursday from 6 until 10 p.m., Friday and Saturday until midnight. Design District Valet is conveniently located in the Miami-Dade Parking Authority Lot just north of the restaurant. The restaurant welcomes walk-ins, reservations, and events at 305.520.5197 or reservations@thcypressroom.com. [UPDATED] Happy Holiday Shopping Begins Now with a Bundle of Genuine Thanks! UPDATE!!!! Happy Monday to you all. Today, online retailers around the capitalist world are celebrating “Cyber Monday.” Here in Genuineland, celebrations of the art and design kind are kicking into gear, as Harry’s Pizzeria and Michael’s Genuine Food & Drink in the Design District have new artworks on display and our pop-up cafe at Design Miami/ continues to fuel exhibitor teams’ through booth construction. Our online shop is open for business with its two bundle coupons still valid until 11:59 p.m. tonight. We are adding a new The Genuine Hospitality Group gift card special for today only! Beginning at 10:30 a.m. this morning, the e-shop’s first purchase of a gift card (or cards in any denominations) totaling $500 or more will receive one Design Miami/ Vernissage invitation granting two people attendance to the opening night event tomorrow, Tuesday, December 3 from 6-9:00 p.m., as well as two passes each granting one person a one day admission to the fair during show hours including lunch for two (up to $50) at the MGFD Cafe during their visit! Seasons eatings! With thanksgiving just days away, we are happy to share two special coupons – “thanksmichael” and “thankshedy” – to jumpstart the holiday shopping season happily on our virtual store. Just a little genuine thanks from our family to yours… details below! Available in brown and red, as worn by our servers at Michael’s Genuine Food & Drink. Our aprons are built to last and handmade in Los Angeles from beginning to end using everything from American canvas, Japanese selvage denim to European linens. And they look great too! 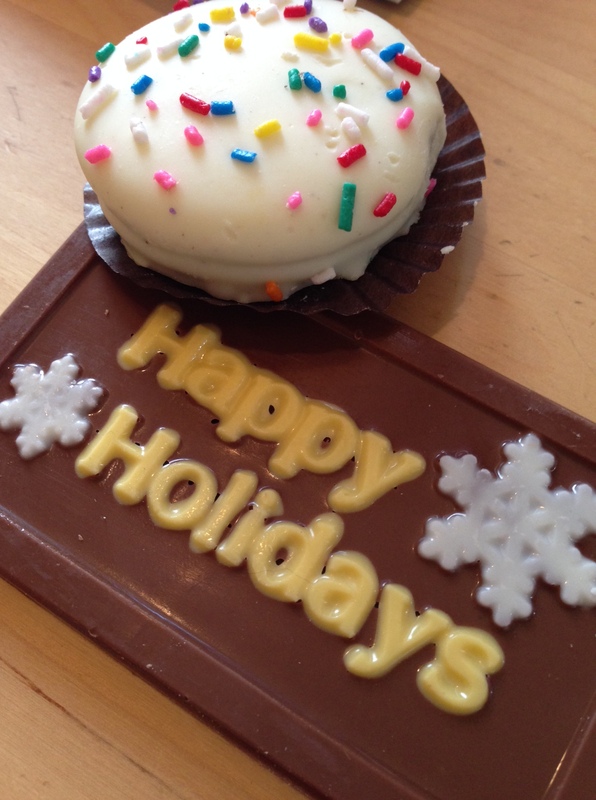 Please consult our posted holiday shipping deadlines when placing orders!